I just realized that the actual VRAM usage isn't reflected in hwinfo, is this intentional? GPU-Z and Radeon Overlay is reporting 5.5GB of VRAM usage, while hwinfo is only showing 3.4GB of D3D memory dedicated. Is there any way to show actual VRAM usage using hwinfo? Reporting GPU VRAM usage on AMD is problematic. I'm not sure which of these values is correct, for example on Radeon Vega 8 (Ryzen 5 2500U) GPU-Z reports 22 GBytes used, which is certainly wrong. 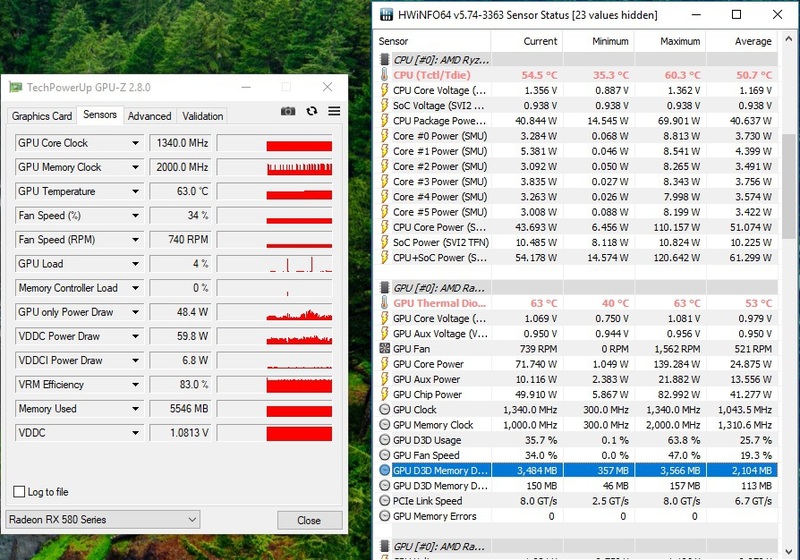 (03-27-2018, 02:03 PM)Martin Wrote: Reporting GPU VRAM usage on AMD is problematic. Could it be that the Ryzen 5 2500U uses integrated memory/ RAM hence it just includes all the system ram together into the calculation? I also tried Radeon Overlay which is provided by AMD's driver, the readings on the VRAM is the same as GPU-Z too. I guess I will just stick to hwinfo's GPU D3D Memory Dedicated readings. Please try the new v5.79-3390 Beta, it features a new GPU memory usage sensor. (03-29-2018, 11:03 AM)Martin Wrote: Please try the new v5.79-3390 Beta, it features a new GPU memory usage sensor. I'm currently using v5.79-3395 Beta. So far so good, I will continue using both D3D and the new memory sensor for the time being. Current time: 04-25-2019, 09:03 PM Powered By MyBB, © 2002-2019 MyBB Group.